Ventricular assist devices market size is set to exceed USD 2.0 billion by 2024; according to a new research study published by Global Market Insights, Inc. 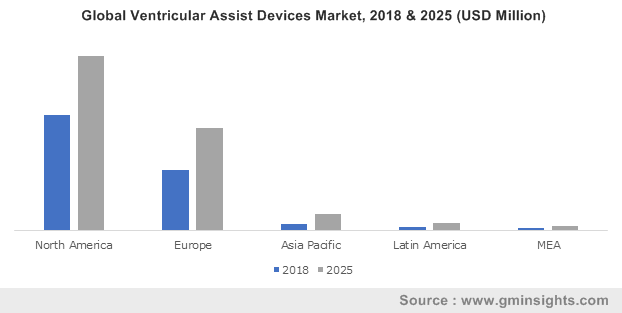 Recent technological advancements in the design and functioning of ventricular assist devices making it more efficient, risk-free and less invasive will lead to growing demand and adoption rate of the device. Improvements in the devices and the implantation procedures has reduced the health risk and increased the survival rate in patients. This rapid technological advancements will be one of the major factors for boosting the market growth in the near future. Growing geriatric population in developing nations of Asia Pacific region will be a significant market driving factor over the forecast timeframe. Cardiovascular diseases are one of the major causes of death in Asia Pacific countries and the growing geriatric population in the region will eventually increase the chances of people getting affected by end-stage heart failure. Hence, rise in the number of older population will result in augmenting the demand and adoption of ventricular assist devices, fueling the business growth. The risks associated with the product and procedure will be one of the major market impeding factors. Patients with left ventricular assist devices have chances of health risks such as bleeding, infection, device pumping issues and right side heart failure. Such health risks will result in hampering the growth of ventricular assist devices market growth in future. Left ventricular devices market is estimated to grow at a CAGR of 10.6% during the projection period. Modern day advancements in the device such as high survival rate, efficiency and low risk will be one of the major factors responsible for the market growth. Growing heart failure rate and lack of heart donors across the globe has led to increase in number of people opting for ventricular assist devices, boosting the industry growth. The sales of ventricular assist devices in the people aged between 60-79 years is estimated to grow significantly at a CAGR of 10.5% over the forecast timeframe. Growing sedentary lifestyle has led to increase in life style diseases such as cardiovascular diseases (CVD) and heart failure. Rising prevalence of CVD diseases in geriatric population will result in boosting demand and adoption rate of ventricular assist devices, augmenting the business growth. U.S. ventricular assist devices market is projected to grow at a CAGR of 9.8% during the forecast timeframe. According to the statistics published by Johns Hopkins Medicine Organization, around 84 million Americans suffer from some or the other form of cardiovascular disease. Growing population suffering from CVD disease, recent technological advancements in the country and favorable reimbursement policy will be few major impact rendering factors on the growth of the ventricular assist device market in the region. Germany dominated the Europe ventricular assist devices market and was valued over USD 106.7 million in the year 2017. According to the statistics published by European Union (EU), around 51,000 heart bypass surgeries were carried out in Germany in the year 2016. CVD diseases are one of the leading cause of death in the Europe region. Growing prevalence of the CVD disease among the Europe region will enhance and drive the growth of ventricular assist devices market in the region.